Christmas is nearly here! 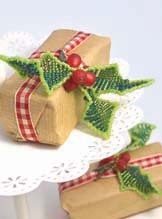 to celebrate I’ve popped the Holly and Mistletoe patterns into the pdf store. 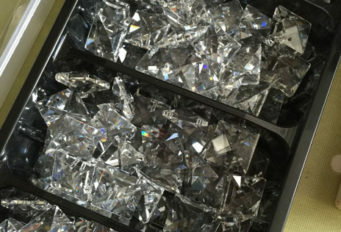 These are quick make designs and the perfect little stash buster project. Both designs are copyright free, I donate the income to charity too. Find the pdf here. I love the teaching part of what I do, it’s always fun to meet new beaders and travel to new venues, so please feel very welcome to come join us at a venue near you. If getting to a workshop is tricky, don’t forget you can browse and download my patterns here. There is something very satisfying about ‘sorting out’, although it has taken a bit longer than anticipated! The satisfying bit is when it’s done and everything looks neat again. 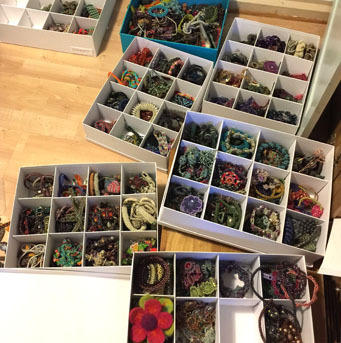 These are just a few of the boxes of beadwork samples I’ve had fun organising. Inside are lots of old favourites, samples from classes, new workshop pieces ready to go and even newer designs that need some more work… and now I can find them all! I love it when an idea sets things in motion. A loom lover spotted this picture in a blog post I wrote a few years ago about my Kerala bangle workshops (you can read it too, here). Then I began to get more emails asking for a ‘how to’. After a lot of rummaging in the archives I found the original notes from the workshop which I’ve tidied up into a ‘recipe with ingredients’ which gives you all the basic info. 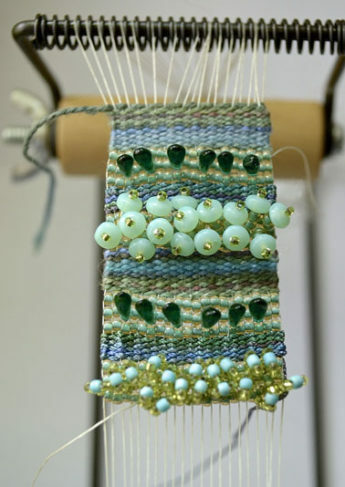 It’s not a step by step, but all you need is a loom, beads from your stash and some embroidery weight threads to get started. Then you can explore the fun of mixing a selection of weaving techniques to create a unique and colourful mix. 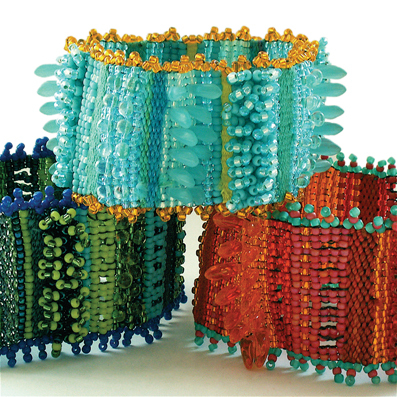 Instructions are included for finishing off warp ends to make a seamless bangle. Tempted to have a play too? It’s now available in the digital store here. Part of being a creative person is the fun of digging out ideas. looking for inspiration is like treasure hunting and mystery solving all rolled together. it’s exciting and enticing and you never know where the next clue will turn up. I’ve long had a fascination with symbols and trinkets and what they mean to the wearer, so I was looking at a book about sacred prayer boxes and reliquaries. I love the idea that jewellery can contain a hidden secret known only to you, the wearer. A relic is ‘something left behind’, a Reliquary is a place to keep a precious object. Next in this particular treasure hunt was the arrival of pyramid shaped beads which resembled many of the decorations I’d seen in the book. Like iron nail heads in oak treasure boxes! I love that we have so many new beads available to play with, some sit on my desk for ages before inspiration strikes, but the pyramid beads I fell for instantly. 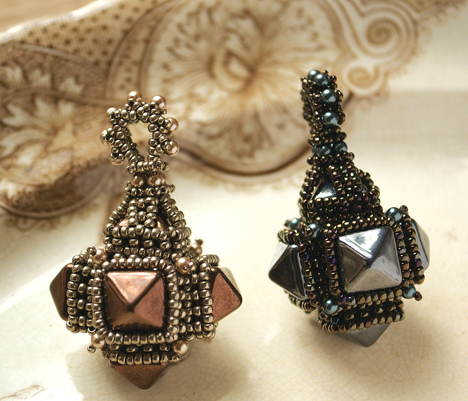 Relic was made using six pyramid beads and embellished with pearls, I really enjoyed how gothic and steampunk it turned out! The pattern is here in the pdf store. I wear my Relic pendant a lot in the autumn as it goes well with the textures of knitted jumpers and winter woolies, I have it on a satin ribbon. 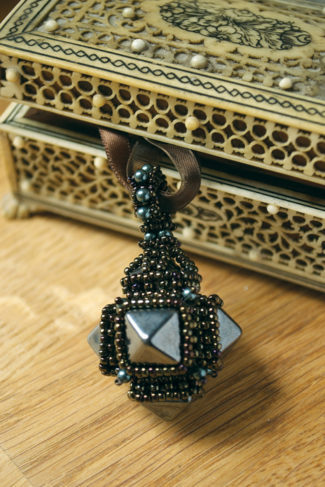 With so many bead colours to choose from it could easily be made in pretty delicate colours too, and if ribbons are not your thing it will easily slide on to a chain. Now I’ve spruced up the house and got into the right frame of mind for the beautiful changing of the season, it’s time to get inspired by all those stunning autumn colours. 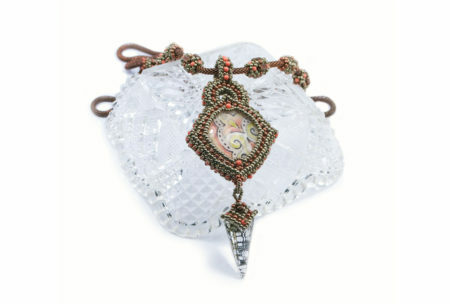 Michaelmas Bracelet is one of my early designs, but one I come back to often as it’s easy and very satisfying to bead. I am lucky to live in a beautiful part of the country and as I drive out to visit and teach, I sometimes go through a Beech tree wood. It doesn’t matter what time of year, these grand old trees always look stunning. 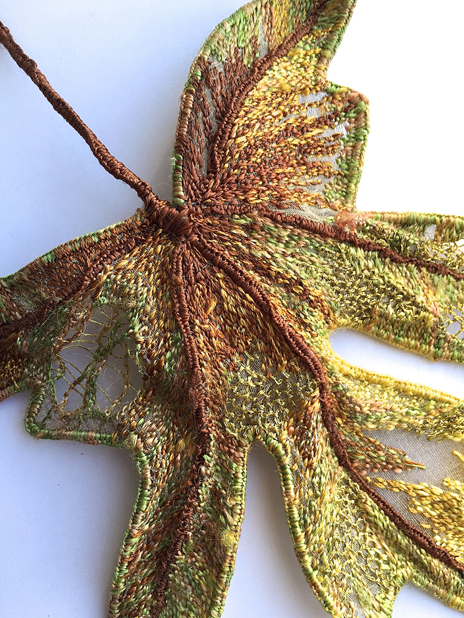 One Autumn I was setting off for a class and t he sunlight was glowing through the turning leaves, as I was teaching in a bead shop that day I decided to stop, collect a few leaves and treat myself to a selection of delica beads to match them. Michaelmas is the feast of Michael and all Angels. The Archangel Michael is one of the principal angelic warriors, seen as a protector against the dark of night. Michaelmas has long been associated with the turn of the autumn equinox and the shortening winter days. The Michaelmas bracelet is cosmic in many ways! 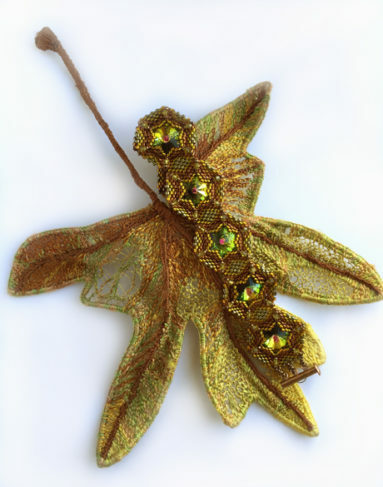 The finished bracelet is shown here on an embroidered leaf, it’s one I made a long time ago. I used to make a lot of hand worked textiles and enjoyed discovering and buying hand dyed threads to use. It’s one of those pieces I look at now and wonder when I ever had the time to make it it must have taken me hours! 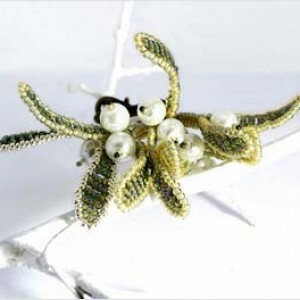 The leaf is stitched entirely by hand and is made by laying fine organza over a wire frame and stitching to cover the wire. Then the fabric is filled with all sorts of stitches and threads until the leaf is done. embrace autumn and spent a happy afternoon cleaning the house and re-arranging bits and pieces. This helps me focus, no really! Changing the energy in each room with a little love and attention and finishing the day with a refreshed house and spirit. The garden has lots of berries, rose hips and seed heads and as I went to pick a bunch to bringing to the house I found a magically iridescent blue black Magpie feather, so I added it to the mix. 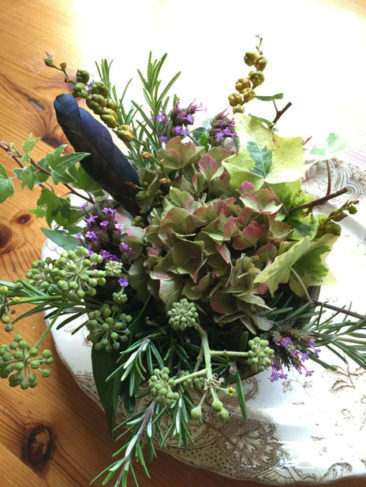 Here is my little bunch of harvest treasure, a faded hydrangea flower, a flash of purple salvia, ivy seed heads, deliciously rusty yellow Crocosmia seed heads, and Rosemary. There is nothing like a bunch of fresh rosemary chopped in a dish to fill the house with fresh green scent. Our village florist provided the next splash of colour. I love visiting and picking out a selection as a special treat, you never know what they will have in. 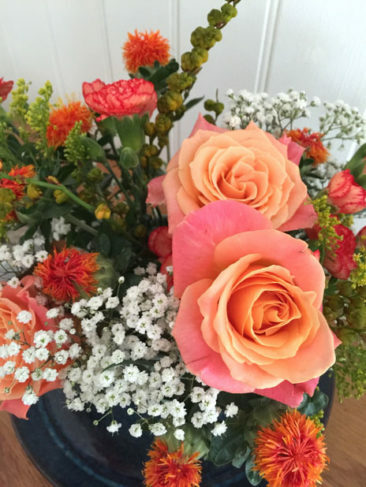 I chose Goldenrod, spray carnations and fluffy orange flowers along with a tiny cloud or two of Gypsophilia and vibrant pinky orange roses. The florist told me these are her favourite, they’re called ‘Miss Piggy’ and fade to a more delicate colour as they open. Now the house is refreshed and I have no more excuses but to get down to work! 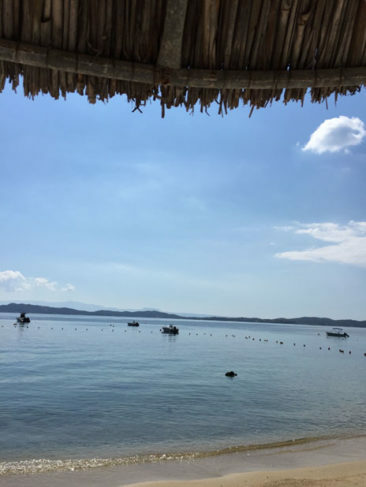 We took a late holiday this year, two whole weeks in Greece. 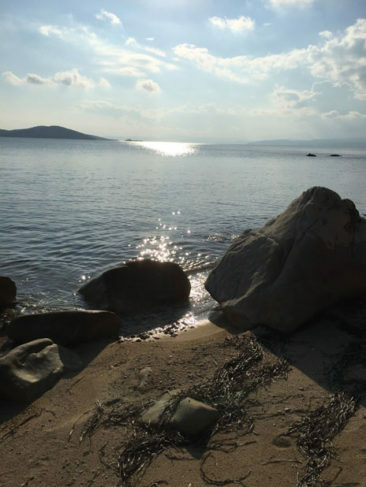 It was bliss to chill out and just sit and listen to the ocean. I think it took about four days for me to get completely relaxed and slow down enough to appreciate long lazy lunches, to wander with no particular destination in mind and to just sit and watch the sun setting. It was also simply heaven to be in the sunshine. I didn’t take any beading with me! which had me twitchy at first, but as my thoughts slowed down, my imagination began to explore so many ideas that don’t usually get room to grow. We were near to Mount Athos and the amazing monasteries, so local souvenir shops were filled with beautiful Byzantine inspired art and jewellery. I confess to packing a notebook, and gradually filled enough pages with ideas to keep me busy all winter. 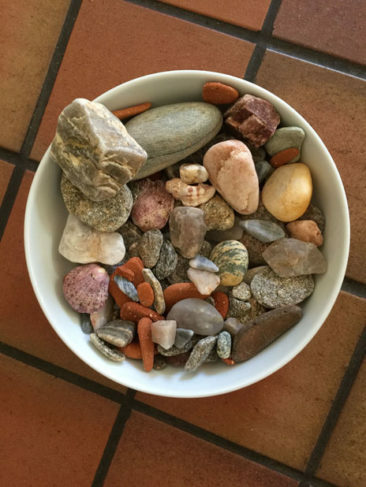 My favourite part of the holiday was beach combing, we were on an amazing shoreline, filled with marble and quartz, a beautifully sparkly stone and instead of sea glass, terracotta shards worn smooth as pebbles by the waves. Now we are home and they sit in a dish with treasures from other holidays to remind me of the warm sun as Autumn gets underway here. I thought it would be fun to share how kits are built at Heatherworks. After a design is created (which is a story for another day). 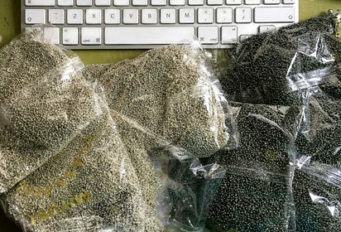 The beads used in a design are counted (yes, really), then that quantity is counted out (which take ages). 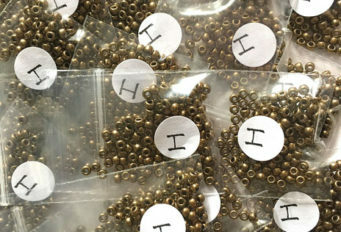 These beads are weighed and a percentage is added for just in case. Materials are ordered in. If a design uses special components it can take a while for them to be made and shipped. 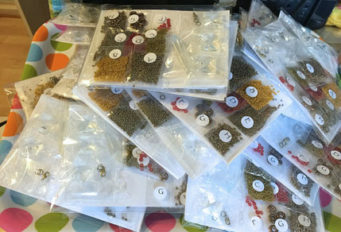 Beads are weighed into little bags and labelled. 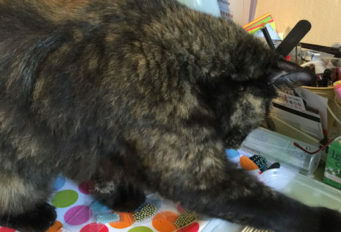 Sometimes there are willing helpers, this is Fennel sorting beads. 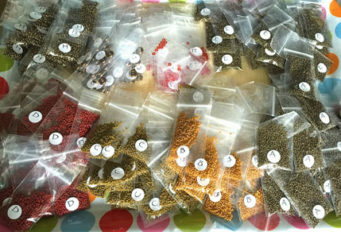 Next the little bags of each bead used, are gathered together and arranged nicely to go into each kit. 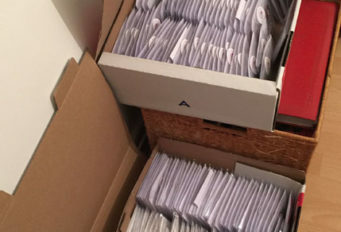 The process is repeated for each colourway, Then the kits are ready to go to a workshop, safely packed in boxes. Or they are filed in the Heatherworks shelves ready for when a customer places an order.